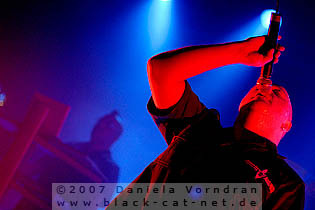 The Irish-British power package of the dark scene is again on tour – in Krefeld it was the last German concert – with its mix of different electronic styles as well as with Industrial, Rock and Dance elements with hard beats. 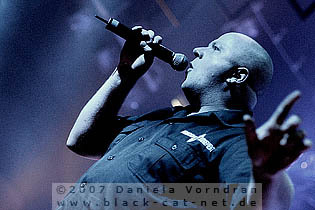 Also, dark dreamy ballads and symphonic-orchestral arrangements belong to VNV NATION’s set. The recently released sixth album ‘Judgement’ can be counted as the most powerful, varied and complex work of the duo, as some fans and critics say. 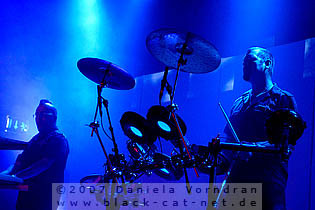 This evening in Krefeld again promised to be a packed and energetic show. 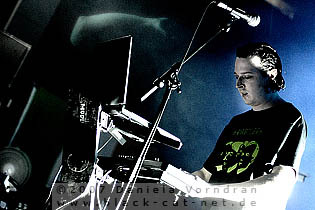 This evening in Krefeld, Geoff presented six tracks of his monotone hard industrial sound with voice samples only. 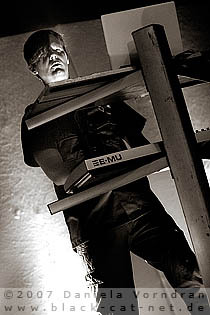 MODULATE call their purely instrumental music hard Industrial but actually they are more on the Techno side of things, as so often with UK acts. Different to previous shows, Geoff was all alone on stage, so you can imagine that the sound he presented came from computer pre-sets. Another difference to the shows I have seen so far was an additionally added song - a cover version of THE PRODIGY’s ‘No good’ that sounded quite good in my ears. Sadly - at least at my position - the sound seemed to be a bit bass dominated. 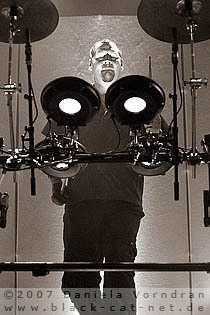 As already mentioned, Geoff was all alone on the big stage this time, acting behind his technical equipment. The missing vocals are still a bit strange, but luckily this time the venue was already packed for the support act what made up for a good mood. Geoff seemed to be quite well too, rocking behind is desk and waving his arms to get people move. Like during the previous shows, the audience reactions were quite mixed, some enjoyed it, some did not really like the stuff. I also had the impression that the light show was more reduced compared with previous shows… less front light and more strobe effects. 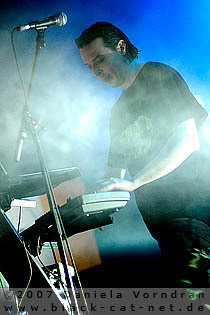 After MODULATE was more a DJ act, now a full band with keys, drums and singer entered the stage. 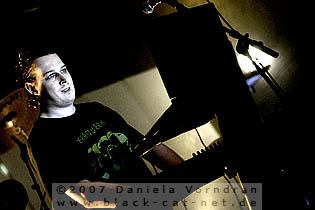 Ted’s dark melodic voice - which sounded a bit rougher in my ears than during the previous shows I’ve seen - was supported by the pushing danceable electro sound as well and the second voice of the keyboard player very well. 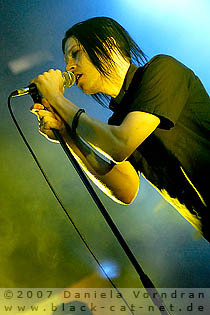 The band’s influences reach from THE CURE and DEPECHE MODE over EBM acts such as NITZER EBB or SKINNY PUPPY to Industrial heroes such as NINE INCH NAILS. All these influences give you an impression how IR sound like. 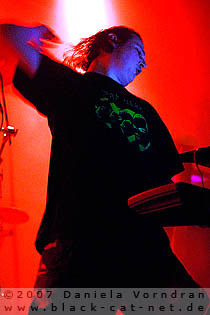 With the most recent album, IR reached a heavier and more aggressive level than before, but still with emotional vocals and deep lyrics, punchy bass lines and driving synths. 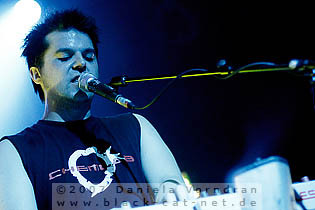 Especially the bass lines were forced by the sound settings during the Krefeld show – in my opinion even a little too much. But that might have been resulting from my position quite close to the speakers. 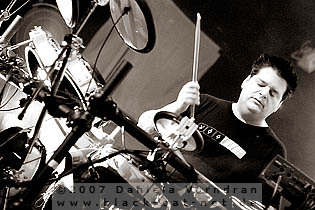 Again we have a line-up change compared to the first leg of the European tour: IR changed the keyboarder and drummer for the second leg, only Ted is the constant part. 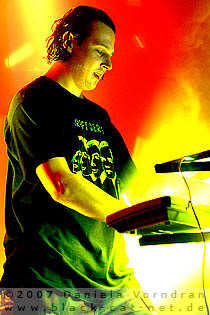 The new keyboarder was Dan McKeaney and the drummer on the second leg of the European tour was Sam Pfannkuche. 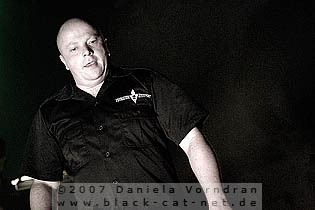 Remembering that this is already the second tour of IR with VNV NATION you can imagine that this band can handle the VNV audience. They performed very powerful right from the start and especially Ted tried to animate the audience which followed in big parts. Even though I still had the impression people were a bit hesitant to move during the support acts and want to keep all the power and energy for the main act of the evening. The lightshow was a little bit spare though and sometimes the musicians were hidden in the shadow in stage which especially occurred during the first half of the show. Later, the lights were brighter and strobe lights were dividing the smoke. 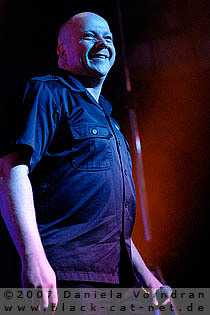 VNV NATION’s music ranges from electronic dance music to ballads but also to classical inspired music whereas inspirations are taken from a wide range of styles including contemporary underground club culture, industrial and classical music. The lyrics draw on philosophy, literature, art, politics and different forms of symbolism. 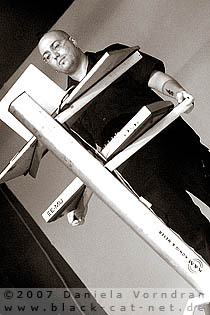 As usual, Ronan Harris and Mark Jackson were supported by two live keyboard players - André Winter and Marco Visconti. 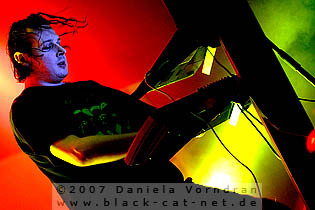 To anyone’s surprise, Vasi Vallis (REAPER, FROZEN PLASMA and also live keyboarder of VNV’s previous tour) joined the band instead of Marco for the first two songs of the encore what was acclaimed with excited applause. Opener of the show was again ‘The Farthest Star’ followed by a well balanced mix of new and old songs including all-time fan favourites like ‘Darkangel’ placed right after the opener, ‘Legion’, ‘Standing’ or ‘Honour 2003’. 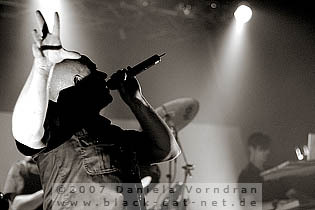 ‘Chrome’ from the ‘Matter+Form’ album was what it is - one of VNV NATION’s finest and most massive crowd pleasers. Also the new stuff - by now known very well within the audience - sounded typical VNV with very danceable, sweeping and catchy sounds. 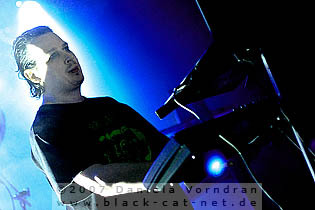 ‘Testament’ and ‘Nemesis’ applied for the next big club hit, while ‘Descent’ set a much darker tone. By now, the sound also seemed to be much better - or was it just my position at the mixer desk? - and Ronan’s voice sounded nearly perfect. 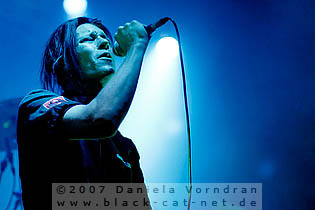 For some songs, huge echo was put on his voice what gave some nice effects. As known from previous shows, the main set ended with ‘Perpetual’. Some surprises occurred during the encores when some heavily demanded songs - like ‘Arena’ or ‘Fearless’ - have been played. Last encore was again the anthem ‘Beloved’ which always satisfies the fans and sends shivers down the spine. It is always a special moment. 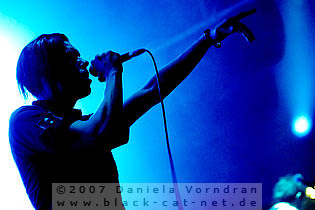 As you could expect and as you know it from previous shows, VNV always deliver a great stage setup with an excellent light show and impressive videos. 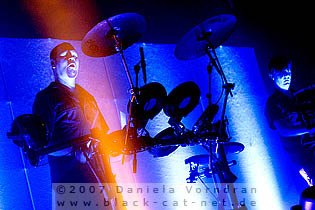 This time, the background of the stage was dominated by huge white walls on which the videos were projected by three beamers. As far as I could see, those videos had changed in parts compared to the first leg of the tour and were really impressive. A special setup of those videos according to the presented songs - like lines out of the lyrics, the VNV logo, water, clocks or female faces - made the whole show something special. 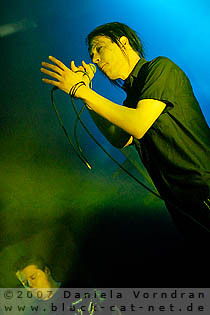 Also the light colours were always fitting very well to the mood of the songs - like i.e. dark red for ‘Illusion’ or ‘Beloved’ only broken by some bright white spots. 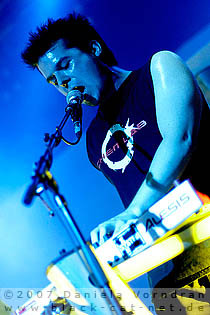 One after another - first the keyboarders and Mark and afterwards Mr. Harris himself - the band entered the stage to the first sounds of ‘The farthest Star’ and immediately the venue turned into a boiling pot consisting of dancing, jumping and screaming people. All this noise brought a very wide smile into Ronan’s face when he welcomed the Krefeld crowd at the last German show of this tour. From the first second it was clear that the charismatic Irishman is a born entertainer and this audience loved to be entertained and was in pure party mood, that’s for sure. After the ‘Judgement’ album has been released few weeks ago, people now knew all the songs and lyrics in and out and so, the crowd sang along any line. 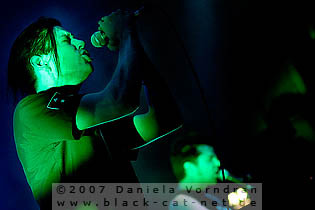 As always, also this VNV show was a big fan happening and not only a sequence of songs being played. 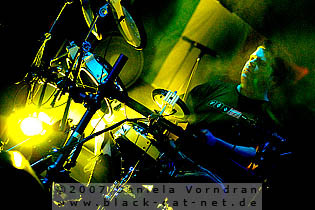 It was rather an electrical storm and a discharge of emotions - not only by mastermind Harris but also by the audience. Ronan as always ran across the stage, hardly ever standing still during the faster songs. On the other side he was standing still behind his microphone during the ballads letting only his voice and the mood of the song work to create this special atmosphere. As always he was very talkative. During ‘Chrome’ he had to express in a mixture of German and English tongue how great it is during that show: “It’s time for you to sing! Was für eine Laune, ist das nicht geil hier heute Abend? (What a mood, isn’t it great here tonight?)”. He’s also joking about some audience reactions what caused the one or another laugh. After ‘Chrome’ he asked “Do you want something fast or romantic?” And when anyone screamed “Fast” he only answered “Ok, so we play something romantic” and with a smile in his face, ‘Nemesis’ started and anyone knew that “romantic” was only another joke. 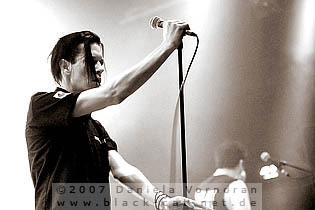 Following song ‘Illusion’ was dedicated to “al the fans of the V.I.P. nation” and immediately you saw quite some hands on the right side holding several glow sticks up. Ok, so that was the spot the V.I.P. nation was standing… or better jumping and screaming most of the time as I could see. ;) Especially for the last song of the main set ‘Perpetual’ really all hands in the venue reached out to the stage. It looked simply amazing. 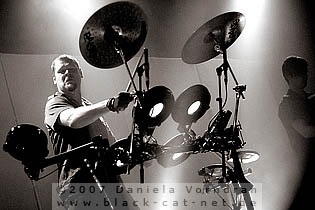 As always, the background of the stage was dominated by Mark Jackson behind his e-drums completing the performance of Ronan with his powerful playing. After the main set finished and the band had left the stage, it took a long time when people were screaming and clapping until the band came back - surprisingly with the mentioned Vasi Vallis instead of Macro in the keys. 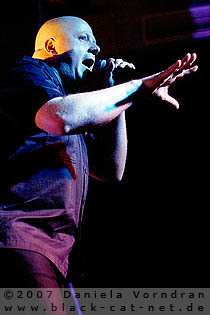 Highly demanded ‘Fearless’ made all fans move – Ronan’s “I want you all to move” wasn’t necessary. Another quite long break followed until the band came back for another two songs. When Marco instead of Vasi entered the stage again, one girl screamed for Vasi what Ronan too as invitation to make some more jokes… this time about the attractiveness of both men. Now it was also time to thank the audience. “The last this audience here will see for a few months. 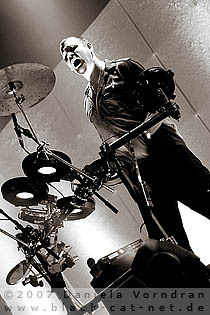 Habt ihr Spass Krefeld (Do you have fun Krefeld)?” For ‘Solitary’ the party at the venue reached its climax and anyone was reaching out his hands for the lines “I have never wanted more” what was commented by Ronan with “Ihr seid richtig grossartig (You are truly amazing)”. 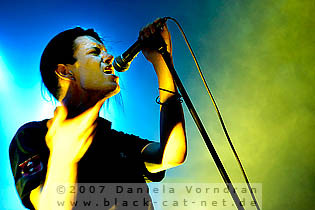 When the band left the stage again, they were demanded back with loud “VNV” yells. 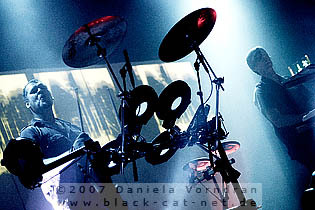 With the announcement “we have one more song for you”, Ronan and Mark returned to present ‘Beloved’ only as a duo on stage - Ronan at the microphone and Mark on keys. This song was again a very touching moment and a great final of this show.